Huawei unveiled the Mate X foldable 5G smartphone on Sunday at Mobile World Congress. Huawei's phone heats up the competition with Samsung, which unveiled the Galaxy Fold last week. The price of the Mate X will start at 2299 euros, roughly $2600. Huawei launched a foldable smartphone on Sunday, striking back at Samsung just days after it launched the first consumer-ready foldable device. Huawei launched the Mate X at an event at Mobile World Congress in Barcelona. The Chinese tech giant said the phone will start at a whopping price of 2299 euros (approximately $2600), and will be available in the middle of 2019. That price tops the high end of Samsung's Galaxy Fold, which will sell for an eye-popping $1980, as well as Apple's premium iPhones. American officials have warned against using Huawei devices out of fear they will enable Chinese spying, charges the company denies. Meanwhile, Huawei has found itself stuck in the middle of tensions between the U.S. and China in the race to roll out 5G networks. The Huawei Mate X is a 5G device that can fold into a slim 6.6-inch smartphone and unfold into an 8-inch tablet. Huawei's launch sets up a battle with Samsung, which unveiled its Galaxy Fold last week, as the world's biggest smartphone makers try to pump innovation into a stalling smartphone market. Unlike Samsung's device, Huawei's Mate X features slightly curved screens that fold backward so that, when closed, there are screens on both sides of the phone. The design makes Huawei's device slimmer than Samsung's when it's folded. The phone will run on Huawei's Kirin 980 processor and Balong 5000 chipset, which supports 5G. The company said the super-fast chipset will allow users to download a 1 gigabyte movie in just 3 seconds. The Mate X is Huawei's first 5G-enabled smartphone. Huawei said it has an advantage over other companies launching 5G devices because it provides the full-range of equipment needed to get wireless networks up and running. The Chinese firm is the world's biggest provider of telecommunications equipment. Huawei did not specify the markets where the Mate X will be available, and it's unclear if the phone will reach the U.S. Increased scrutiny from the U.S. and other countries hasn't dented sales in Huawei's consumer business so far. The unit reported a record $52 billion in sales in 2018, up 50 percent from the year before, citing strong demand for its premium smartphones. Huawei overtook Apple as the world's second largest smartphone maker last year, behind Samsung. The company has proven resilient to a broader slowdown in smartphone sales in China, with smartphone shipments soaring 23 percent in the country in the fourth quarter of last year, according to market research firm IDC. Apple's Chinese iPhone shipments, meanwhile, plunged 20 percent in the same quarter. 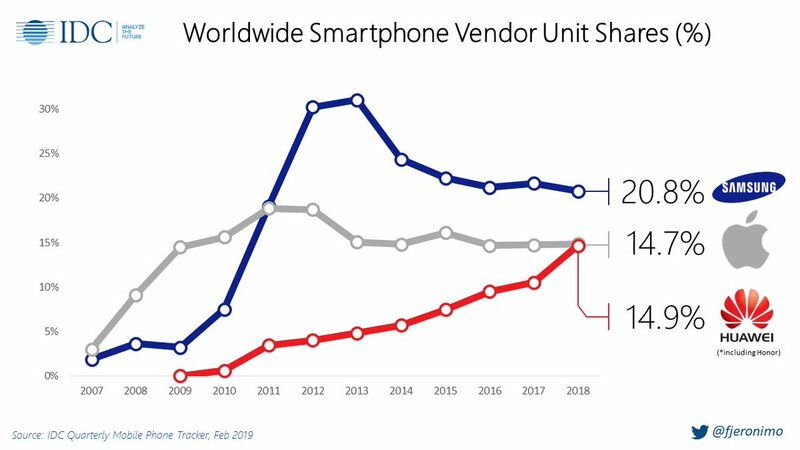 "Huawei has acquired a clear edge over the competition for extensive applications including photography, gaming and business usage by building solid technology prowess and innovations and collaborating closely with suppliers," the IDC report said. Still some analysts are worried about the high price tags of the foldable devices from Huawei and Samsung. Research shows consumers have already been holding onto their phones longer, finding it hard to justify spending $1000 or more on a new handset. Notably, Apple has not said whether it plans to develop a foldable device. Huawei also released an upgraded version of its premium laptop at the launch event on Sunday. The new MateBook X Pro has a touchscreen display that enables users to take a screenshot using their fingers. The notebook also has a new feature called "OneHop" that speeds up sharing photos, videos and documents between Huawei devices. Unlike Apple's Airdrop which uses Bluetooth, the Huawei feature works when a smartphone is tapped on a small button on the laptop.